You will need Xcode, Cocoapods and Node installed on your machine. Basic knowledge of iOS development will be helpful. In this tutorial, we are going to see how you can add user presence to an iOS application using Pusher Channels, Node.js, and Swift. We will create a sample chat application to demonstrate this feature. However, because we are focusing on just user presence, we will not implement the actual chat feature. If you are building an application that has a user base, you might need to show your users when their friends are currently online. This comes in handy especially in messenger applications where the current user would like to know which of their friends are available for instant messaging. If you want a tutorial on how to create a messenger application on iOS, check out this article. A Pusher Channels app. Create one here. Node.js and npm installed on your machine. Installation guide. Before creating the iOS application, let’s create the backend application in Node.js. This application will have the necessary endpoints the application will need to function properly. To get started, create a new directory for the project. This command will install all the dependencies we defined above in the package.json file. Replace the PUSHER_APP_* placeholders with your Pusher application credentials. In the code above, we imported the libraries we need for the backend application. We then instantiated two new variables: users and currentUser. We will be using these variables as a temporary in-memory store for the data since we are not using a database. Next, we instantiated the Pusher library using the credentials for our application. We will be using this instance to communicate with the Pusher API. Next, we add the listen method which instructs the Express application to start the application on port 5000. Above, we have the first route. The route is a POST route that creates a new user. It first checks the users object to see if a user already exists with the specified name. If a user does not exist, it generates a new user ID using the generate_random_id method (we will create this later) and adds it to the users object. If a user exists, it skips all of that logic. Regardless of the outcome of the user check, it sets the currentUser as the user that was created or matched and then returns the currentUser and users object as a response. Above, we have the Pusher authentication route. This route gets the expected socket_id and channel_name and uses that to generate an authentication token. We also supply a presenceData object that contains all the information about the user we are authenticating. We then return the token as a response to the client. The function above just generates a random ID that we can then use as the user ID when creating new users. 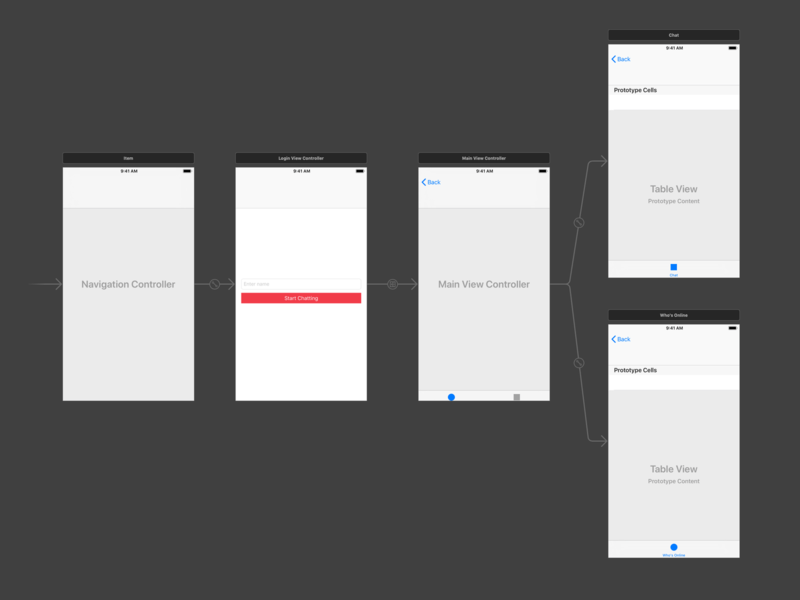 Launch Xcode and create a new sample Single View App project. We will call ours presensesample. The command above will install all the dependencies in the Podfile and also create a new .xcworkspace file in the root of the project. Open this file in Xcode to launch the project and not the .xcodeproj file. Open the main storyboard file and delete all the scenes in the file so it is empty. Next, add a view controller to the scene. TIP: You can use the command + shift + L shortcut to bring the objects library. 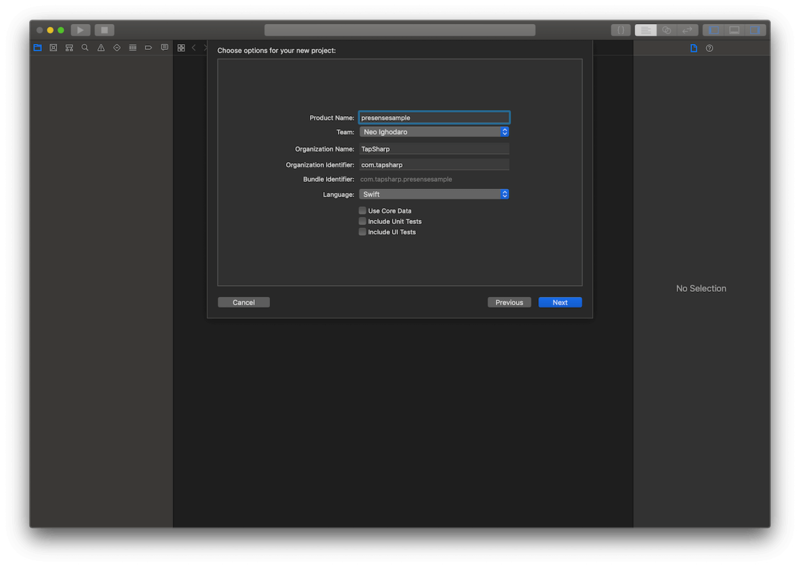 With the view controller selected, click on Editor > Embed In > Navigation Controller. 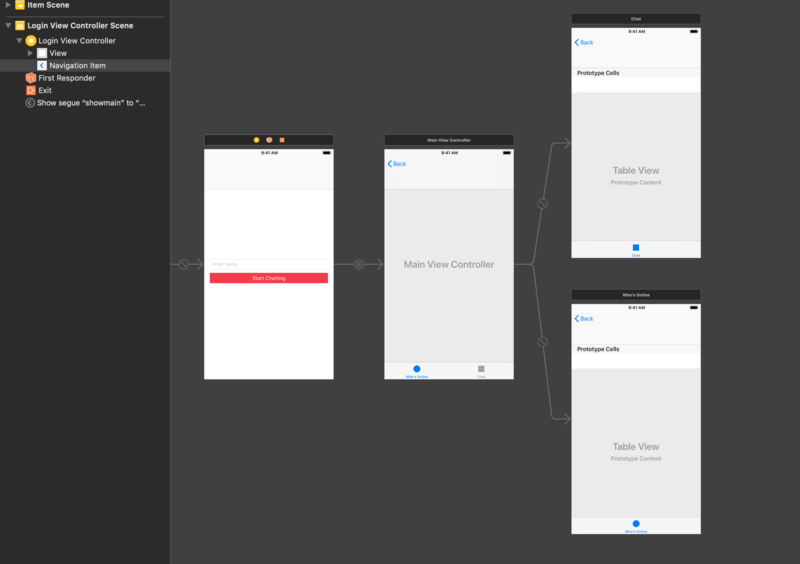 This will embed the current view controller in a navigation controller. 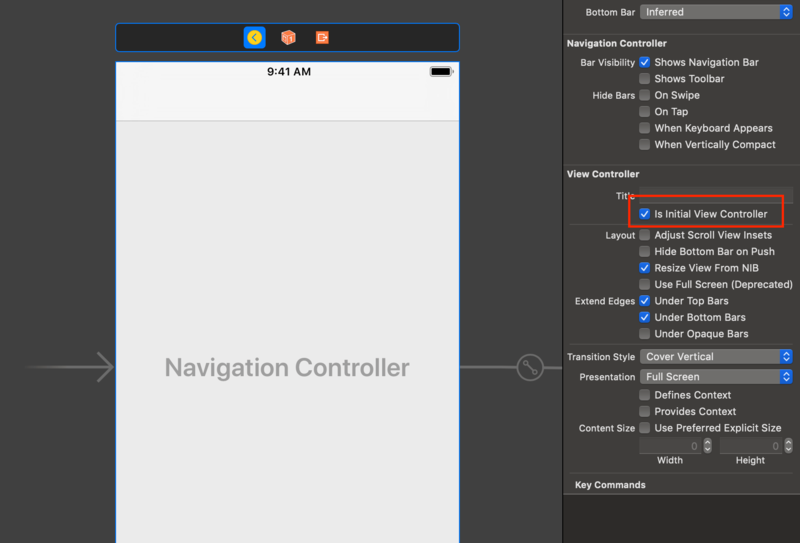 Next, with the navigation view controller selected, open the attributes inspector and select the Is Initial View Controller option to set the navigation view controller as the entry point for the storyboard. Next, design the view controller as seen in the screenshot below. Later on in the article, we will be connecting the text field and button to the code using an @IBOutlet and an @IBAction. When you are done creating the scenes, let’s start adding the necessary code. In the controller above, we have defined the users and user properties which will hold the available users and the current user when the user is logged in. We also have the nameTextField which is an @IBOutlet to the text field in the storyboard view controller, so make sure you connect the outlet if you hadn’t previously done so. In the same controller, we have the startChattingButtonPressed method which is an @IBAction so make sure you connect it to the submit button in the storyboard view controller if you have not already done so. In this method, we call the registerUser method to register the user using the API. If the registration is successful, we direct the user to the showmain segue. The segue between the login view controller and the tab bar controller should be set with an identifier of showmain. In the registerUser method, we send the name to the API and receive a JSON response. We parse it to see if the registration was successful or not. The final method in the class is the prepare method. This method is automatically called by iOS when a new segue is being loaded. We use this to preset some data to the view controller we are about to load. In the controller above, we have a few methods defined. The viewDidLoad method sets the title of the controller and other navigation controller specific things. We also define a Logout button in this method. The button will trigger the logoutButtonPressed method. In the logoutButtonPressed method, we try to log the user out by resetting the users property in the view controller and also we disconnect the user from the Pusher connection. The controller above is just a base controller and we do not intend to add any chat logic to this controller. cell.textLabel?.text = "\(user.name) \(user.online ? "[Online]" : "")"
In the code above, we first defined a User struct. We will use this to represent the user resource. We have already referenced this struct in previous controllers we created earlier. Next, we defined the OnlineTableViewController class which is extends the UITableViewController class. In this class, we override the usual table view controller methods to provide the table with data. You have to set the cell reuse identifier of this table to onlineuser in the storyboard. pusher - this will hold the Pusher SDK instance that we will use to subscribe to Pusher Channels. users - this will hold an array of User structs. user - this is the user struct of the current user. In the viewDidLoad method above, we are doing several things. First, we instantiate the Pusher instance. In the options, we specify the authorize endpoint. We use the same URL as the backend we created earlier. onMemberAdded - this event is called when a new user joins the presence-chat channel. In this callback, we check for the user that was added and mark them as online in the users array. onMemberRemoved - this event is called when a user leaves the presence-chat channel. In this callback, we check for the user that left the channel and mark them as offline. Next, we bind to the pusher:subscription_succeeded event. This event is called when a user successfully subscribes to updates on a channel. The callback on this event returns all the currently subscribed users. In the callback, we use this list of subscribed users to mark them online in the application. Finally, we use the connect method on the pusher instance to connect to Pusher. Now, our app is ready. You can run the application and you should see the online presence status of other users when they log in. In this tutorial, we learned how to use presence channels in your iOS application using Pusher Channels. The source code for the application created in this tutorial is available on GitHub.